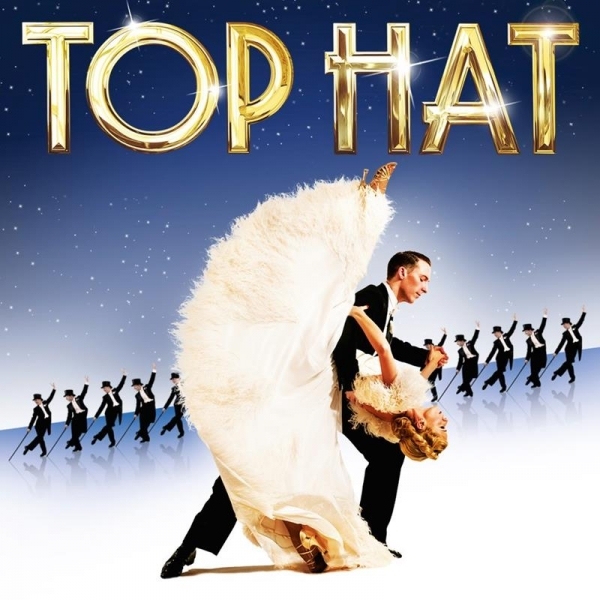 Following its triumphant Olivier Award winning West End run, Top Hat is back on tour bringing the West End to your doorstep. Taking the audience back to Hollywood’s golden age of the 1930’s, the plot follows famous American tap dancer Jerry Travers, as he travels to London to make his West End debut, but becomes distracted when he meets the girl of his dreams, swish model, Dale Tremont. What follows is a harmlessly humorous story of love, glamour and mistaken identity, as Tremont erroneously believes that her ardent pursuer, Travers, is married to a friend of hers. 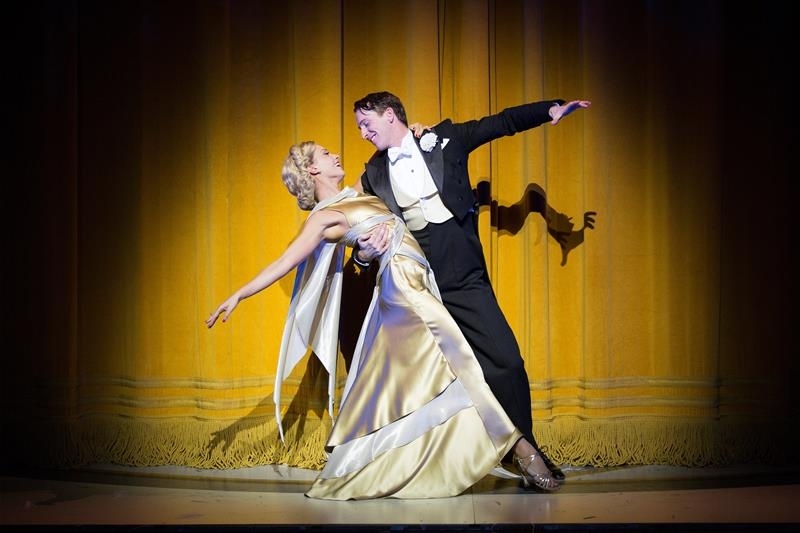 The musical’s new stars, Alan Burkitt (who understudied the role in the West End) and Charlotte Gooch (who reprises her West End performance), shine as Jerry and Dale; recapturing the musical’s original music. Burkett and Gooch were born to star opposite each other. Their chemistry couldn’t have been stronger, particularly during their divine dance numbers; together they are utterly mesmerising. There were also some other terrific performances; Clive Hayward as the hen pecked theatre producer Horace Hardwick and Rebecca Thornhill as his clever and witty wife were both wonderfully funny. Sebastien Torkia was hilariously over the top as the vain and vengeful Italian fashion designer, Alberto Beddini, and there was the lovely comic turn from John Conroy, who brought a delicious suggestion of Charles Hawtry in the Carry On Films to the very funny butler, Bates. Immersing the audience was Hildegard Bechtler’s art deco design set, which was a stylish delight, whisking us from grand hotels in London and Venice by way of an ingenious sequence set aboard an aeroplane. With shimmering chandeliers to the string of lighting off Broadway, there were mountains of tiny details and hidden gags within the show, creating a feast for your eyes whilst the vocal talents of the cast brought the talent to the ears. 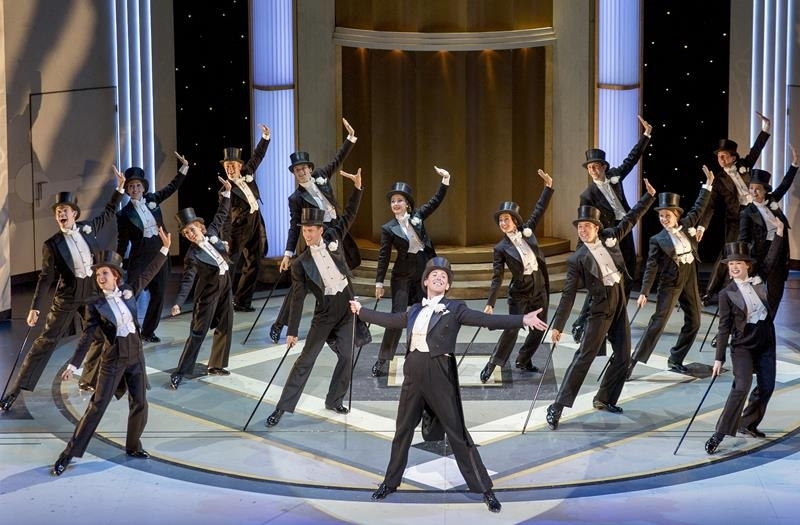 With his wonderful costumes, Jon Morrel captured the feel of each character, even the ensemble were perfectly outfitted with outfits that dazzled and added refinement whilst at the same time, complimenting the choreography beautifully. This was escapism at its most elegant. We had telegrams instead of texts; satin and silk dresses instead of skinny jeans and even smoking breathed an air of confidence instead of ill health. My how times have changed. 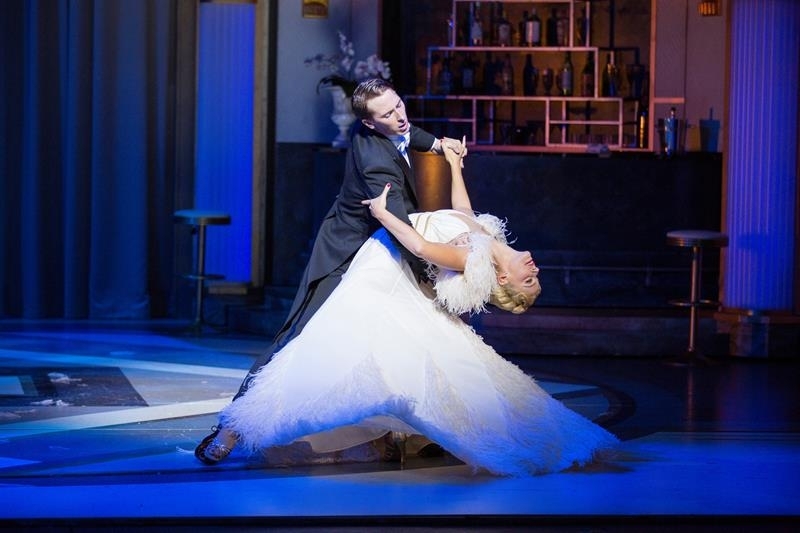 But what hasn’t changed however, is the quality of Irving Berlin’s classic songs, and Bill Deamer’s choreography which it must be said, barely moved a millimetre out of synch all night. Naturally Cheek To Cheek and Let’s Face The Music And Dance were the songs most graciously entertained, and there’s no doubt that the infectious tap dancing will make you sign up to dancing classes as soon as you leave the Theatre. Wild About You saw Tremont being elegantly spun around in feathers, whilst you can never hear too often Berlin standards like Isn’t This A Lovely Day (To Be Caught In The Rain?). But it was Top Hat, White Tie And Tails that everyone wanted to see and we were not disappointed. The hypnotic tap of the immaculately dressed dancers was the song of the show. This production was class at its finest with slapstick and wit injected to fully immerse the audience. With tops and tails for the gentlemen and alluring feathers and cocktail gowns for the ladies, Top Hat was an evening to dress your best for. There may be troubles ahead, but that’s only for those who do not immediately grab a ticket for this stunning production.